Steven Wright is a Lecturer at the University of York. 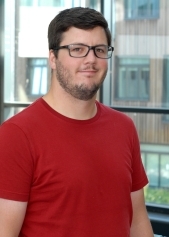 His current research focus is the use of High Performance Computing (HPC) in plasma physics simulations. Dr. Wright is working with the Centre for Computational Plasma Physics with colleagues from several UK universities, the UK Atomic Energy Authority, the Rutherford Appleton Laboratory and the UK Atomic Weapons Establishment (AWE). Following a secondment to Sandia National Laboratories in 2016, Dr. Wright is also collaborating with Sandia on an unstructured particle-in-cell application. Dr. Wright completed his PhD in 2014 at the University of Warwick, in collaboration with AWE plc. and Los Alamos National Laboratory, focusing on the monitoring, analysis and optimisation of I/O in parallel applications.